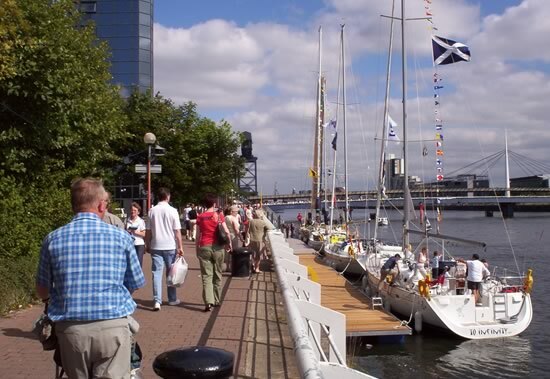 Glasgow's international reputation as the 'Friendly City' is reflected in the effervescent and colourful plethora of festivals and cultural events that are showcased in this vibrant metropolis each year. Celtic Connections is the crème de la crème of festivals in Glasgow, celebrating the cultural diversity and nuances of Celtic Music from various regions of the world, including Nova Scotia, Brittany, Ireland and Galicia. This internationally acclaimed festival takes place in the month of January and has attracted crowds of 100,000 in the last couple of years, adding substantial revenue to Glasgow's winter economy. Another popular musical festival is the Glasgow International Jazz Festival, showcasing many of the world's outstanding jazz singers and musicians who appear at various venues across the city. Previous performers have included the likes of Tony Bennett, Nitin Sawney and Isaac Hayes. The festival will be celebrating its 20th anniversary in 2006 and next year will be a special one for your events calendar. March features the much-loved and ever-popular Glasgow International Comedy Festival which showcased an exciting line-up of the UK's foremost comedians and impersonators at last year's event, including Paul Merton, Jack Dee and an array of familiar Scottish humour from Karen Dunbar, Fred MacAuley and Phil Kay. This dynamic fun-packed festival grows from strength to strength each year and next year will showcase more big names from the international and British comedy circuit. Art is strongly represented in Glasgow's extensive programme of annual festivals and after its successful first year, Glasgow International is set to enthral art enthusiasts with an extraordinary collection of contemporary visual art exhibited at various indoor and outdoor venues throughout the city. This festival is held in late April and early May to coincide with the Glasgow Arts Fair, held annually in George Square. Other Glasgow Arts Festivals include New Territories held in February, featuring various artistic disciplines, including visual art and choreography. Glasgow celebrates Scotland's national instrument, The Bagpipes with The Piping Festival staged at the Glasgow Piping Centre and outdoors in July/August. This fairly young festival attracts pipers from all corners of the globe to perform different styles of piping and offers and extensive programme workshops and classes. In addition, The World Pipe Band Championships are held in August in Glasgow Green and attract over 8,000 pipers from almost every country in the world. The festival started in 1986 and has grown into one of Glasgow's finest events, featuring competitions and an array of activities and food.